Our best memory of Portuguese food was a spectacularly juicy steak served with a luscious red wine from the Alentejo, while watching an exquisite Fado performance at Cafe Luso in Lisbon. What can top that gastronomic memory? Portuguese food is fairly unknown, and what a pity as there are so many delicious dishes. Seafood and meat are present in the majority of traditional dishes, and sometimes even in the same dish. Feijoada can be found almost anywhere (and interestingly is also the national dish of Brazil) and is a bean stew, slow cooked with bacon, meat tomatoes, onions, garlic, parsley, olive oil, eggs salt and pepper. “Cozido a Portuguesa” is another stew, similar to Spain’s “Cocido”, made with beef, chicken, pork (smoked), rice, beans, cabbage, potato, carrot, and turnip- rustic but heavenly. The Alentejo is a huge area, which encompasses the region east of Lisbon and nearly the entire south, only leaving the tiny strip of the Algarve along the coast. The Alentejo is the land of Cork Forests, rolling hills, and castles. The gastronomy, interestingly, has a few things in common with Spain’s Catalonia region. In Catalonia, there is a concept of “Mar I Muntanya” (sea and mountains), which refers to the blending of fish and meat in the same dishes. The Alentejo has a very common dish called Lombo de Porco com Amêijoas (pork steak with clams) that uses this technique. 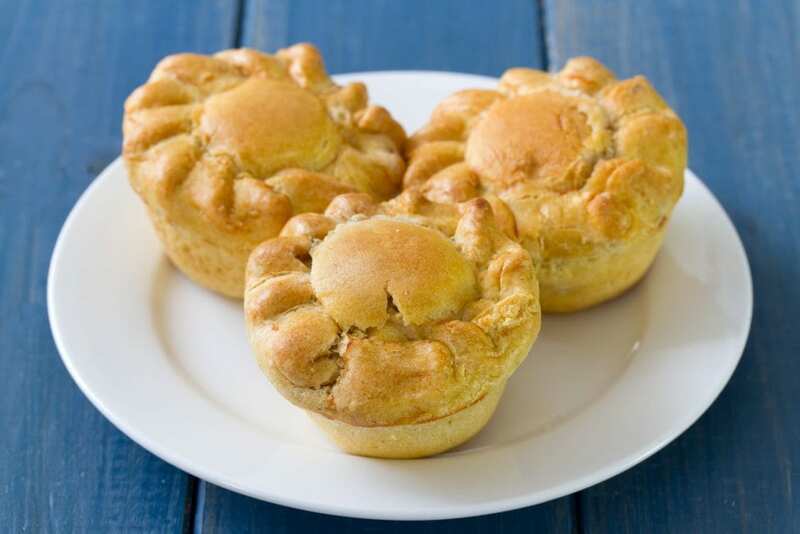 Other common meals include Cozido de Grão com Vagens à Alentejana (a delicious lamb and chick pea stew) and Empadas de Galinha (little puff pastries stuffed with hen and potatoes). Further south in the gorgeous region of the Algarve, which stretches from Tavira westwards to Sagres. The cuisine in this region is noticeably influenced by the Moors, particularly with the regional desserts. Typical dishes you can find at every charming fishing village from Albufeira to Lagos include: shark soup, razor clams, Prawn Bisque and Rice with Octopus. Arabic touches on the “Doces” (desserts) are seen in the typical Fig Pastries, Honey Fritters, and Almond Cakes. 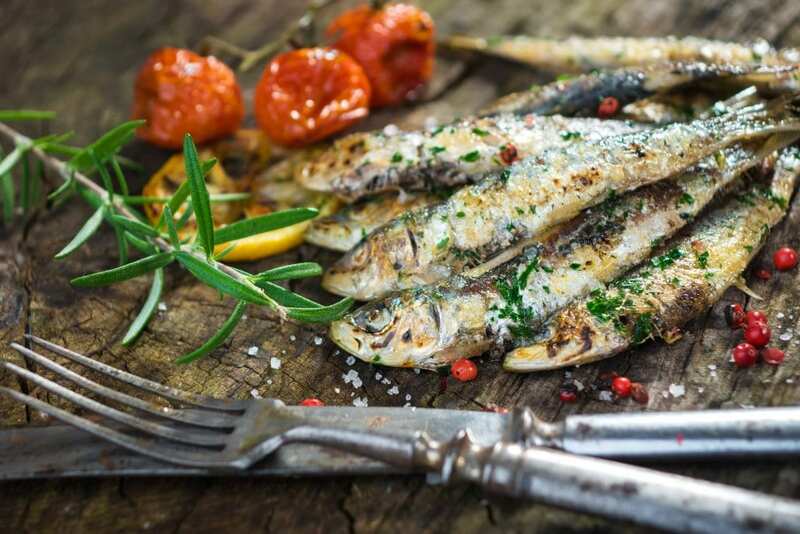 Apart from the ubiquitous seafood and fish dishes, including grilled sardines (“sardinhas grelhadas”), salt codfish (“bacalhau”), and tuna steaks (“bife de atum”), the “Lisboetas” also like their meat. You will frequently see dishes like “cozido à Portuguesa” (boiled meats and sausages with vegetables), and “carne de porco à Alentejana” (pork cubes served with clams from the wine region of Alentejo, just east of Lisbon). “Frango Assado” (roast chicken) is also a specialty, and there is a great restaurant called Bonjardim in the Baixa district, calling itself the “Rei dos Frangos” (“King of Chickens”), where lovely roast chicken is served with homemade french fry wedges and salad. The Solar do Vinho do Porto is a great wine bar in Lisbon, located in a classy, 18th-century mansion where you can taste hundreds of ports by the glass. You can also buy bottles of whatever you like. It’s on the street, Rua de São Pedro de Alcântara 45. North East of Lisbon, the cuisine is heavy on the beef and stews. Dishes such as Bife à Café (an interesting beef steak dish spiced up with a dash of mustard), Favada à Portuguesa (identical to Spain’s fabada, made with butter beans, various cuts of pork and slow cooked for hours) and Creme de Camarão (thick prawn soup) are traditional for the area. As the rest of Portugal, Oporto’s cuisine is heavily based on fish and seafood. 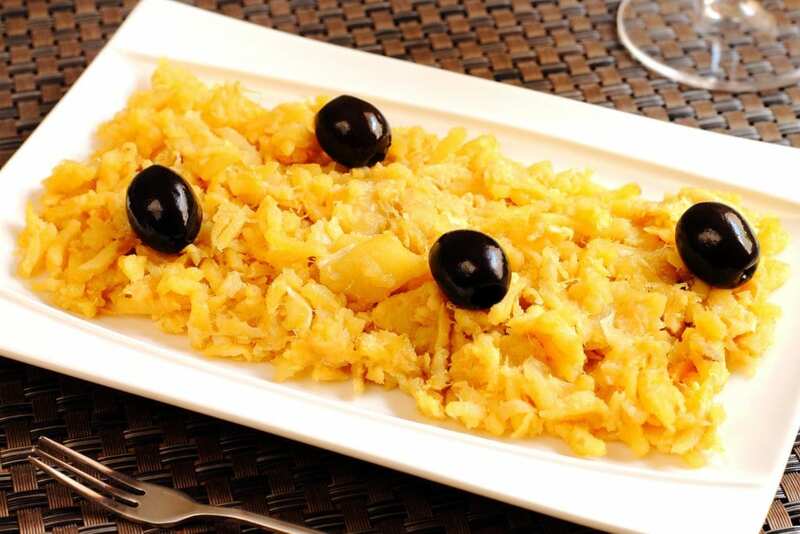 Dishes you will commonly see on restaurant menus can include “arroz de marisco” (seafood with rice), “bacalhau assado no forno” (cod roasted in the oven), “bacalhau à Bras” (cod fried with egg, potatoes & onions), “caldeirada”, (fish stew popular all over Portugal and lovely with the Vinho Verde wines) and “açorda de marisco” (seafood mix served with fresh bread). You’ll also find “cavala” (mackerel), “cherne” (stone bass), “enguias” (eels, an acquired taste), “linguado” (sole) “polvo” (octopus, sometimes served with paprika and quite nice with White Port), “raia” (skate, delicious) and the ever-present “sardinhas”. Port is served more as an aperitif, with cheese, and as a dessert wine, although White Port is commonly drunk throughout a meal. The wonderful zippy white wines from further north, bordering Spain’s Galicia, accompany the seafood perfectly. In the interior, up in the beautiful mountains, the cuisine is more dominated by meat dishes and the traditional soups. “Cabrito ou Anho Assado” (Roast kid), Arroz de Pato à Moda de Braga (Braga style Duck with rice and Chorizo sausage) and Cabidela de Miúdos (a succulent Pork dish common in Viana do Castelo) are all extremely typical dishes from the area. Sparkling jewels in the Atlantic, the cuisine of the islands of Portugal is obviously heavy on the seafood and is normally paired with the light white wines and fortified Madeiras. In Madeira, Tuna is big and comes in a dazzling array of styles from tuna, steak (bife de atum), roast tuna (atum assado), pickled tuna to tuna salads. Salt cod is present, as in the Portuguese peninsula, along with swordfish, and cuttlefish. Many of the desserts in Madeira are made with the gorgeous local sweet wines: Moscatel, Malmsey, Rainwater, Bual, Sercial and vintage Madeira. 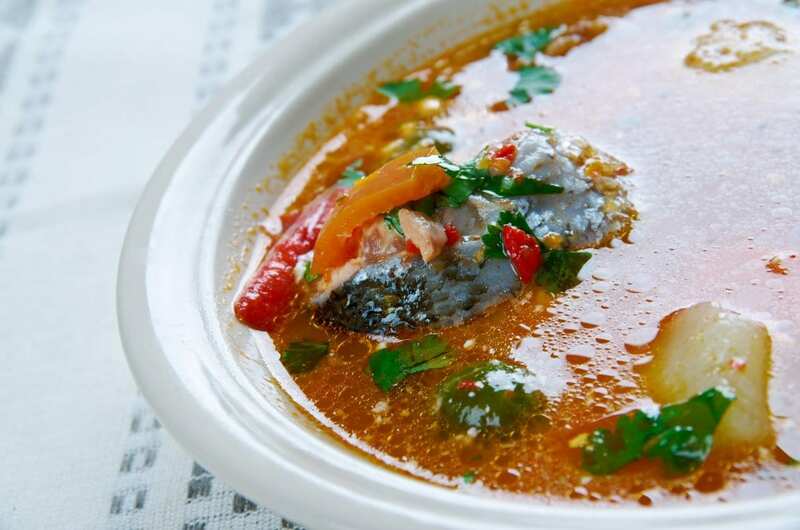 The Azores inhabitants enjoy superb seafood fished locally, like “Polvo Guisado” (slow cooked Octopus stew) and the fabulous “Caldo de Peixe” (a seafood soup with everything from mussels, clams, whitefish, squid, and prawns thrown in). In the Azores, nearly all of the dishes have religious names, from “Espécies de São Jorge” (a biscuity dessert made with cinnamon, called “St George’s Spices”) to the serious sounding “Sopa do Espïrito Santo” (“Holy Spirit Soup”, a beef and chicken stew).